2015 is right around the corner, will your recruitment team be ready for the challenges ahead? iCIMS has compiled 15 common problems that recruitment departments face because their recruitment technology lacks core functionality. 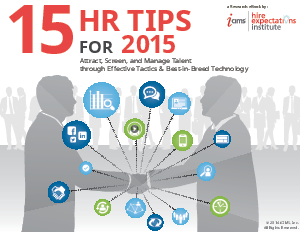 The 15 Tips for 2015 eBook will show readers technology best practices to attract, screen and manage candidates. Viewers will also have the option to view a video demonstration of the iCIMS Talent Platform, a best-in-breed Talent Acquisition Platform.